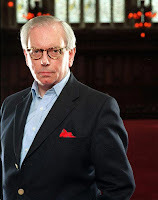 The British Library has posted David Starkey's lecture on Henry VIII. The always entertaining Starkey discusses how biography has become a female dominated genre (huh? ), why Henry wrote like a girl, and how his Dad was a tough act to follow. It all comes back to how the women in his life altered Henry's personality....which is an ironic stance to take considering that his latest book has been marketed as the non feminised biography of Henry. He likes to show both sides? But fabulous! thanks for the link. I love David Starkey.